It's pasta for supper tonight, so I fancy a Vegetable Lasagne. 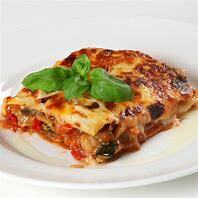 Lasagne is a classic Italian dish and very straightforward but delicious to produce and everyone should know how to make it. Follow this recipe and you can't go wrong. Sprinkle with salt and pepper, then add the tomatoes, lentils, water and oregano and bring to the boil. Simmer for about 30 minutes, or until the lentils are tender. Mix together the cream cheese and the beaten eggs. 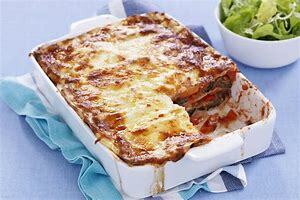 Spread half the vegetable mixture over the bottom of a large ovenproof dish and cover with a third of the lasagne sheets. Pour over half the cheese mixture, then cover with another layer of lasagne sheets. Make a layer with the remaining vegetable mixture, cover with remaining lasagne sheets and, finally, with the rest of the cheese mixture. Sprinkle over the Parmesan and bake in the oven for 40 minutes.